Once upon a time there were three little turtles, Tyler, Tucker, and Trixie. Tyler was a thoughtful turtle who loved to sit quietly and watch the world around him. Tucker was a top notch turtle who always wanted to be boss and lead his friends on exciting adventures. Trixie was a terrific turtle who loved to talk and talk and talk with her friends. One day Tucker invited them to go exploring. They climbed up a slippery white mountain and found a curious basin. While they were staring into this curious basin, Tyler suddenly slipped and went spinning down into the bottom. Oh no! The sides were too slick for him to climb out. What was Tyler to do? "Don't worry, Tyler!" called Trixie. "We'll get you out!" But even as she said so she wasn't so sure. Turtles are not very good at rescues. Suddenly a hand reached into the slippery sided basin and plucked Tyler out. Tyler was scared at first but Tucker called out, "It's okay! Just hold on!" The turtles were all reunited and lived happily ever after. If you want to bring one home with you check them out HERE in my Etsy shop. 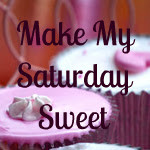 Thanks for linking up on the Make My Saturday Sweet blog hop! This is so cute! I love that you added a story to sell an adorable hand-made product. All the best with your Etsy shop!